The most magical time of the year is upon Victorians: election season. The (taxpayer-funded) gifts promised by the major parties far exceed anything Santa could bring. And the multi-billion-dollar toys on everybody’s wish list? Trains, tracks and roads. There’s nothing unusual about politicians promising big-ticket items to curry favour with voters, but this election the size of these commitments is astronomical: more than A$170 billion worth of projects are on the table. Grattan Institute has crunched the numbers, investigating the major parties’ transport infrastructure pledges worth more than A$50 million. Although cost is a cause for concern, the recent trend towards first conducting business cases is encouraging. Population growth has been a big topic in the lead-up to Saturday’s state election. Politicians often cite it as the cause of ever-worsening congestion, despite evidence that Australia’s cities are actually coping quite well. It’s often assumed that a city’s transport infrastructure needs to grow at the same rate as population. This misconception allows politicians to promise popular mega-projects in the name of busting congestion. Labor has the most extensive and expensive suite of projects, at a cost totalling A$95 billion. More than half of that is just one project: a A$50 billion suburban rail loop that rings around Melbourne’s middle suburbs and connects most train lines. The Coalition’s commitments total $65 billion. The difference in the major party totals is mainly due to the smaller scale of the Coalition’s flagship rail project: a A$19 billion promise to deliver “European-style high-speed rail” to Victoria’s regional cities and towns. 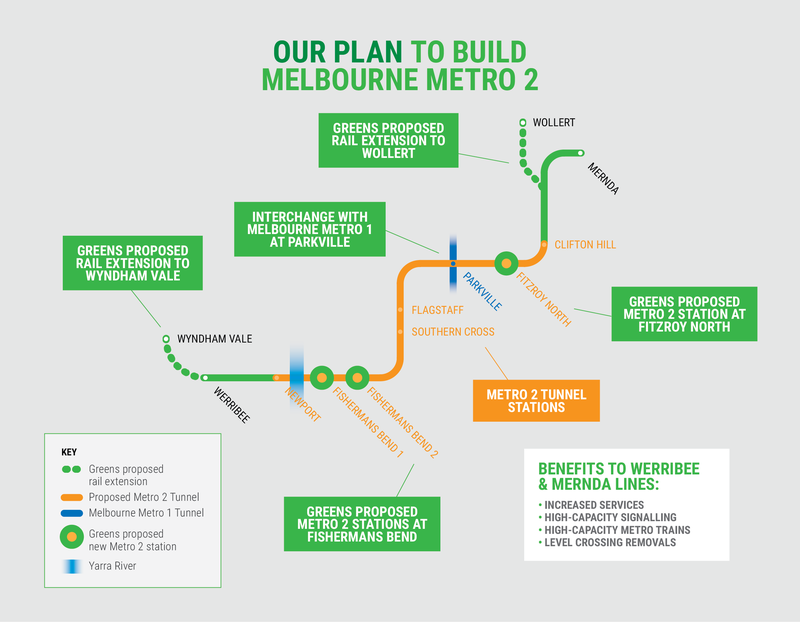 The Greens’ promise with the biggest price tag is the A$23 billion Melbourne Metro 2 project (click map to enlarge). The Greens have so far committed to projects worth at least A$72 billion. The largest is Melbourne Metro 2 at an estimated A$23 billion. These promises mean that every party wants the credit, if elected, for being the government that built the largest transport infrastructure project in our nation’s history. The current title holder, WestConnex in Sydney, totals only A$16.8 billion. No matter who wins on Saturday, the full cost of the promised infrastructure won’t be felt immediately. Many of these projects are slated to run over years or decades and will have an impact on several budgets. Voters have the job of deciding not just where they want their money spent, but their children’s money too. The major parties don’t tend to agree on much, especially around election time. The value of their unilateral pledges exceeds the value of projects with multi-party support. Parties differ in both what they promise and where they want to build it, and the patterns are fairly predictable. Public transport (particularly heavy rail) is the winner this election, but it’s clear that parties tend to choose projects that fit with their ideology. The Coalition has promised the most for roads. The Greens have focused almost exclusively on public transport. The Coalition’s projects are skewed towards benefiting regional Victorians. Labor and the Greens have announced projects that focus mainly on Melbourne. These patterns may be influenced by where the parties’ respective voting bases tend to cluster, but also by the demands of different parts of the state. For instance, congestion may be a less salient issue in the regions, so voters there may prefer health or education investment rather than big-ticket transport infrastructure. Is all this spending wise? the party has not made the funding arrangement clear. An interesting phenomenon this election is the practice of pledging a business case only. At first glance, this appears misleading – voters might be enticed by the prospect of a mega-project, yet the party has to fork out only about 1% of the total cost if it wins. Ideally, parties would have independently evaluated business cases ready before committing to projects, so voters could rest assured that any promised project is a smart one. This is important because projects announced prematurely tend to have the largest cost overruns. And without doing due diligence, there’s not enough evidence that the initiative will deliver enough benefits to justify its price; voters won’t know whether it’s a good use of taxpayer funds until it’s built and they’re stuck with it. So promising a business case is still better than committing to a project without one – or, worse still, committing to a project that clearly does not stack up. Both Labor and the Coalition are guilty here. Labor has committed to rail duplication between Waurn Ponds and South Geelong, despite Infrastructure Australia – the nation’s independent advisory body – warning that “the costs of the project outweigh its benefits”. And the Coalition has promised to revive the massive East West Link, despite the Victorian Auditor-General’s criticism of the original project: “… the EWL business case did not provide a sound basis for the government’s decision to commit to the investment”. Of the infrastructure promised this election, only the North East Link has a business case that Infrastructure Australia has assessed and approved. But this is a state election and Infrastructure Australia is required to assess only projects of national significance for which more than A$100 million in federal funding is sought. Fortunately, since 2015 Victoria has had its own independent advisory body: Infrastructure Victoria. It set out recommendations for the state in its 30-Year Infrastructure Strategy. The Greens’ platform is most closely tied to these recommendations, both by number of projects and total size. While the Coalition has made the most pledges that do not align with Infrastructure Victoria’s strategy, Labor’s set of non-aligned projects is worth far more, owing mostly to the suburban rail loop. The huge infrastructure promises this election may excite some voters, but for parties to pledge “visionary” projects outside of what Infrastructure Victoria has recommended smacks of hubris. By building their own glitzy mega-projects without doing due diligence, politicians risk choosing badly and failing to solve the underlying problems voters care about. Worse, the state has a finite budget, so worthwhile projects will have to be relegated to the bottom drawer to make way for the attention-grabbing goliaths. Going into the polls, Victorians should have one thing on their transport infrastructure wish lists: projects with rigorous and independently assessed business cases. Anything less than that is like buying your kids shoddily manufactured, untested toys. And that may well end in tears once they’re unwrapped. A note on sources and assumptions: Election commitments were sourced from official party media releases and websites. Only infrastructure promises worth more than A$50 million were considered. Given Labor is in government, only Labor promises pertaining to a “re-elected Andrews government” were included. Judgment had to be exercised to avoid double counting when existing promises were subsumed into later ones. Similarly, care was taken not to double-count projects announced as part of a larger program, such as individual level-crossing removals. Where a party released a range of cost estimates, the largest value was taken. Australian governments regularly spend billions of dollars cancelling infrastructure projects, or dealing with delays and legal challenges. The NSW Berejiklian government, for instance, is mired in legal battles around Sydney’s light rail project – with the Spanish company building the rail line suing the government for A$1.2 billion for costs and damages. Other examples include the cancellations of the A$1.1 billion East-West link in Melbourne and Perth’s A$450 million Roe 8 project. Research shows transport infrastructure is costly because of its size, complexity, and the misrepresentation of project benefits, resulting in cost overruns. But transport projects are also costly because they are controversial. Governments and project proponents can spend significant amounts of money to manage the risk of project cancellation, delays and legal challenges. Transport will be a key policy battleground area in the upcoming Victorian election. Just this week, the Andrews’ government announced a A$50 billion underground suburban rail loop, which will link every major rail line in Melbourne and the new airport rail. The announcement is politically motivated rather than being grounded in a publicly engaged strategic planning process attached to a clear evidence-base. Victoria is not alone in such political infrastructure planning. The NSW government is currently embarking on the largest transport infrastructure project in the country’s history, with the 33km WestConnex. The project continues to attract opposition from some parts of the community and from the City of Sydney. WestConnex is also currently subject to a parliamentary inquiry into its impacts, including the adequacy of the business case for the project and the compulsory acquisition of property. The inquiry comes following pressure from community groups and some members of the state’s Greens. Large-scale transport infrastructure will always attract attention because it involves the distribution of a finite resource in complex regions pressed with significant infrastructure needs. But we need to consider why transport infrastructure is almost always so controversial, and how politicians can ensure they have the public’s trust when making announcements for all transport projects. Australia has a history of anti-road activism that centred on the notion cities are for people not cars, as large motorways divide communities and promote car dependency. In the 1960s and 70s, large urban motorways were set to pave over suburbs as part of a wider urban regeneration agenda, which set the anti-road agenda in motion. When the East-West Link was proposed again in 2012, many of the same activists from the 1970s returned to the scene. One such activist, Tony Murphy, would lead a high-profile legal challenge to the project in 2014. Inner-city motorways – such as the East West Link and Stage 3 of the WestConnex project – are underpinned by this historic opposition. And it’s strengthened by the privatisation of roads and the introduction of toll roads. Under these conditions concerns will continue to be put forward about who actually gains to benefit from such projects – private companies, the government or the people? Inner-city motorways crystallise competing visions for the Australian city. Should we be investing in roads or rail, or both? How do we prioritise delivery? Where should we be investing? How will we pay for these investments? And do the benefits – and we need to be clear about how we define these – outweigh the costs of construction, the loss of natural assets and urban displacement? The act of investing in one form of infrastructure over another becomes a symbol of what we value. Road based infrastructure planning is controversial because it’s often seen to value cars over non-road based alternatives. We often see roads as controversial as they become a symbol of our value of cars. The East-West Link, West Gate Tunnel, North East Link and WestConnex projects are symbols of past poor investment in integrated land use and transport planning. They are also a symbol of little clarity and coherency about what it is we are aspiring to, and how these expensive projects will help us get there. There are concerns projects are being announced before they are properly costed. And this has been further complicated by the introduction of public and private partnerships and more recently the use of market-led proposal schemes (where a private firm makes an infrastructure proposal to goverment), which calls into question the role evidence and the business case plays in decisions about transport infrastructure. These concerns are only exacerbated when public access to this data is difficult to obtain. And they will only intensify unless bodies such as the ACCC demand data accessibility, including from tolling operators and sharing platforms. In Toronto, project business cases are written before investment announcements are made. The business cases are then used in wider discussions about what kinds of infrastructures the region should invest in. While every city and region has its challenges, the controversy in Australian cities has become as much about the role of evidence, including its accessibility and transparency, as it is about the contents of those documents. plan transport with a regional outlook, but also be mindful of stories and histories of the places and neighbourhoods that might be affected. Ultimately, residents must be engaged in discussions about urban scenarios and project alternatives. Infrastructure Australia recently released a set of guidelines for big projects. These guidelines are important. We can also look to Infrastructure Victoria. They included a citizen jury method in the development of their 30-year strategy, which perhaps can be expanded into a larger planning exercise that ties the visions with short-term solutions – such as better quality bus integration. These can then be linked with the more ambitions ideas such as a suburban rail loop as announced this week. When cars, trucks, bikes and pedestrians come together at an intersection, design makes the difference between collisions and safety. This is the sixth article in our series, Moving the Masses, about managing the flow of crowds of individuals, be they drivers or pedestrians, shoppers or commuters, birds or ants. A major issue for road safety is collisions at intersections between vehicles and vulnerable road users such as cyclists, motorcyclists and pedestrians. In such collisions, often the driver is momentarily unaware of either the vulnerable road user or of their planned path through the intersection. While many factors can cause this lack of “situation awareness”, the design of the intersection is critical. With numbers of vulnerable road users increasing, how intersections are designed requires urgent attention. If you look at the intersections in your local area, many appear to have been designed primarily with drivers and efficiency in mind. The designs show little consideration of the needs of vulnerable road users. Typically, we see high speed limits, no dedicated bicycle lanes through the intersection, no filtering lanes for motorcyclists, and short crossing times for pedestrians. This can make it difficult for vulnerable road users to pass through safely. And critically, the lack of overt protection for these vulnerable users also reduces drivers’ expectation of encountering them. This can lead to something that we call a “looked-but-failed-to-see error”: drivers are not aware of vulnerable road users even though they may have looked at them (this phenomenon is explained here). what they need to know to support safe interactions. Our next step involved using a sociotechnical systems-based design process to create new intersection design concepts. A sociotechnical system is any system in which humans and technology interact for a purposeful reason. Our aim was to develop a series of new intersection designs that better support the “situation awareness requirements” of all users. The most important finding from our on-road studies was that different road users experience the same intersection situations differently. Critically, these differences can create conflicts. For example, drivers tend to be concerned with what is ahead of them, and specifically the status of the traffic lights. In contrast, cyclists and motorcyclists are concerned with working out a safe path and then filtering safely through the traffic. Thus, drivers who are not expecting them are often not aware of them or of what they might do next. A key implication of our findings was that intersections should be designed to cater for the diverse situation awareness needs of all road users. The environment should facilitate safe interactions by ensuring that all road users are aware of each other and understand each others’ likely behaviours. Based on this, we set about designing a series of new intersections using a sociotechnical systems design approach. Among other things this approach aims to create systems that have adaptive capacity and can cope with a diverse set of end user needs. design should consider the specific needs and preferences of different users. We used these values as part of a participatory process to create three intersection design concepts. The design brief was to replace one of the intersections from the on-road studies (see below). Figure 1. Bird’s-eye view (above) and first-person view (below) of the intersection to be replaced with new design, Map data ©2012 Google. When we evaluated the designs with drivers, cyclists, motorcyclists and pedestrians, two of the designs performed best against key criteria: alignment with sociotechnical systems values, attainment of key intersection functions (such as to minimise collisions, maximise efficiency, maximise compliance, optimise flexibility), and user preferences. The first design is known as the “turning team” design. It works on the premise that different road users could work effectively as a team when proceeding through the intersection. To do this the design aims to make drivers explicitly aware of other forms of road user (to connect the team) and provides each with a clear and dedicated path through the intersection. Like all good teams whose members function based on different roles, the design aims to clear cyclists from the intersection before allowing motorised traffic to enter. Other features include a pedestrian crossing path wide enough to accommodate cyclists who are not comfortable with using the road, motorcyclist filtering lanes, and phasing of traffic lights based on road user type and direction of travel. The second design is the “circular” concept. It explicitly separates motorised and non-motorised traffic. A circular pathway around the intersection is provided for pedestrians and cyclists to use. This pathway links with cycle lanes running down the centre of the road, separated by a kerb from the roadway. On the roadway, this design provides a separate bus lane and a motorcycle zone at the front of the intersection to encourage motorcyclists to filter to the front. Finally, the design incorporates signs warning motorists to be on the lookout for cyclists and for motorcyclists filtering through the traffic from behind. The way forward for intersection design? The road transport systems of the future will be markedly different to those of today. Intersections will become intelligent, with the capacity to “talk” with vehicles, and driverless vehicles will negotiate intersections for us. This is a long way off, however. In the shorter term, intersections will likely comprise a complex mix of standard vehicles, driverless vehicles and partially automated vehicles, as well as cyclists, motorcyclists, pedestrians, and perhaps new forms of vulnerable road user. Without change, intersections will continue to kill and injure at an unacceptable rate. Our research provides important messages for how the intersections of the future should be designed. Designers should equally consider the needs of all users, rather than considering drivers first and the rest afterwards. Critically, this should extend to driverless vehicles and automated systems. What, for example, are the situation awareness needs of a fully driverless vehicle when negotiating an intersection? How can intersection design support these needs as well as those of human users? Designers should not fall into the trap of assuming that all road users require the same information when negotiating intersections. While separating them physically, the intersection of the future should aim to connect its users cognitively. We would like to acknowledge our colleagues and collaborators who have contributed to this research, including Professor Mike Lenne, Associate Professor Guy Walker, Professor Neville Stanton, Dr Natassia Goode, Dr Nick Stevens and Dr Ashleigh Filtness. An image prepared in 1984 by the late Phil Belbin of what the Very Fast Train south of Canberra could look like. An image from the 1990s of a SpeedRail train at Central Station. Can Australian high speed rail overcome its bumpy history? Queensland’s Tilt Train intercity service has been running for nearly 20 years. further track upgrades are under way. The 2017 Victorian Infrastructure Plan outlines priorities and funding for projects over the next five years, with longer-term policy directions.